The Mexican Winter Baseball League’s version of “Spring Training” will return to the Valley for the sixth consecutive year. The Mexican Baseball Fiesta will return to Sloan Park, 2330 W. Rio Salado Parkway in Mesa. This year’s games will be on Sept. 30 and Oct. 1. Three of the top teams from the Liga Mexicana del Pacifico will participate: Los Naranjeros de Hermosillo, Águilas de Mexicali, and the Cañeros de Los Mochis. “The Mexican Pacific League, is as popular in Mexico as Major League Baseball is in the U.S., if not more so,” said Francisco Gamez, Mexican Baseball Fiesta, founder, and LLC partner. Gamez played over 10 years in the Mexican Pacific League as well as in the Milwaukee Brewers organization in the states. Constant excitement is the best way to describe the Mexican Baseball Fiesta. “The energy of the fans, the music and fun make this a unique experience for all baseball fans. This event embraces our Mexican friends and visitors,” Gamez said. Feder was a general manager in minor league baseball for 30 years (15 years in Tucson). “The Mexican Baseball Fiesta is a rare opportunity for baseball fans in the U.S. to experience authentic Mexican baseball games, which features a festive atmosphere including live music and authentic regional Mexican cuisine. The Mexican Baseball Fiesta is not just a baseball game; it’s a party,” Feder said. Mesa is one of a number of cities taking part in this year’s Mexican Baseball Fiesta. The other cities finalized are Tucson and Las Vegas. Tickets to the general public go on sale in early September online. Ticket prices are box seats – $15 and general admission – $10, kids (6-16) $6. 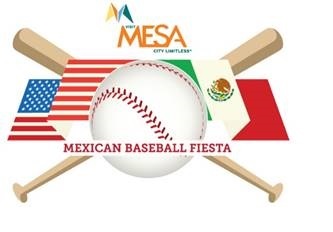 Fans will be able to purchase tickets online at MexicanBaseballFiesta.com, at Food City, MV Snack & Sushi and Taqueria Cajeme in Mesa, La Gran Bota, Restaurant Sinaloa, or at Sloan Park the week of the games.